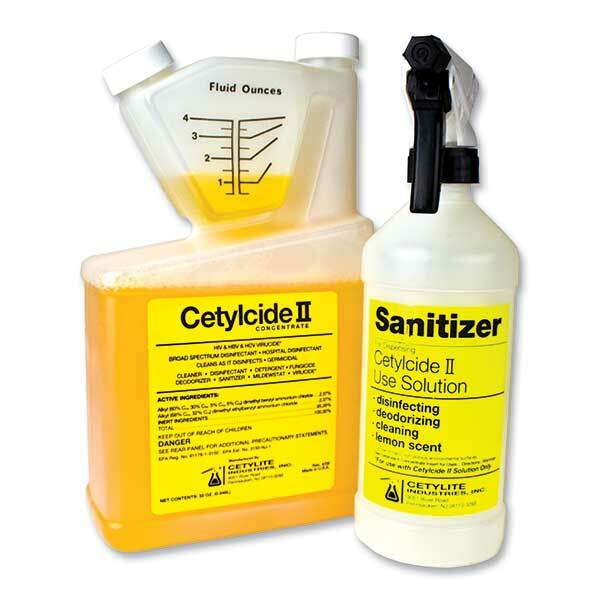 Patient Sleep Supplies > Cleaning Supplies > Cetylcide Ii Germicidal Concentrate 32 oz. A germicide designed for professional use. Kills 140+ pathogenic organisms including HIV, Infl uenza A, Hepatitis B and C, VRE, MRSA & Infl uenza A / Brazil Virus (H1N1) Safe to use on all water-safe surfaces 1/2 oz bottle makes 1 quart of ready-to-use solution 2 oz of Cetylcide-II concentrate makes 1 gallon of use solution 1 quart of Cetylcide-II Concentrate makes 16 gallons of use solution Reduces storage space and shipping Broad spectrum surface disinfectant/deodorizer Complies with OSHA Blood borne Pathogen Rule Pleasant lemon scent32oz.